Legendary actor Amitabh Bachchan avoids watching live telecasts of cricket matches involving India because he believes whenever he does so his home team loses, a newspaper report said on Tuesday. Bachchan, 64, is known to be an avid cricket fan and has even lent his voice to a special song composed to inspire the Indian team participating in the World Cup, which opened in the West Indies this week. 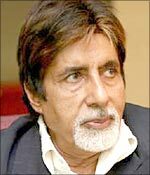 "I normally don't watch tense matches because I have this superstition that India will lose if I watch the match," Bachchan, among the busiest Bollywood actors even at his age, told the Times of India newspaper. "That's why I watch it after the results." The iconic actor, who has inspired generations of Bollywood aspirants, is confident India will bring home the World Cup. "The team is good in all departments," he said. "The blessings of the entire nation are with the Indian cricket team."